THE ANCIENT PENOBSCOT, OR PANAWANSKEK. The HISTORICAL MAGAZINE and Notes and Queries concerning The Antiquities, History, and Biography of America. [Third Series, Vol. I, No. II; Whole Number, Vol. XXI, No. II] February, 1872. [Morrisina, N.Y., Henry B. Dawson] pp. 85-92.
by HON. JOHN E. GODFREY, Esq., of Bangor, Maine. The spelling of the original name of Penobscot was a difficult matter with the early French, in this country, for it was spelled by them, as our late Secretary, Doctor Ballard, discovered, in not far from sixty different ways: Panouamike, Panawanskek, Piimnaouamske, Panahamaequet, Panamske, Panaomske, Panaouamsde, Panaouamske, Pauouamske, Panoumsque, Panouske are some of the forms. The English did better; they caught the sound, Penobscot, and kept it. It is difficult to determine when the English established that pronunciation. We find it thus spelled, in [William] Strachey's account ["The Historie of Travaile into Virginia Britannia; expressing the Cosmographie and Comodities of the Country, together with the Manners and Customes of the People. Gathered and observed as well by those who went first thither as collected by William Strachey, Gent., the first Secretary of the Colony." (London, 1612)] of the expedition that sailed from England, in 1606, to establish the Popham Colony. He says that, on the eighth of September, "Captain Gilbert, with twenty-two others, departed in the shallop for the river of Penobscot. Strachey, however, wrote in 1618 that Captain John Smith was upon the coast, in 1614, and visited Penobscot. The name does not appear in the journal of Weymouth's voyage, in 1605, although it is believed, by many, that the Penobscot was the river he visited. At the time Champlain sailed up the river, in the Autumn of 1605, it was called, by the savages, "Pentagoët." Mount Desert was called "Pematig," or "Pematiq;" and from this, it is said, the waters of the bay and river, westward, acquired the name Pematigoëtt, and, finally, "Pentagoët." This name the French afterward applied to the Peninsula of Matchebiguatus – commonly called Bagaduce – now a part of Castine; the English applying, to the same locality, the name, Penobscot. It would relieve curiosity to know if there was a permanent Abenakis village, prior to the advent of the French, bearing the name of Panawanskek. The Abenakis, according to La Hontan, were a wandering people. They must have been so by necessity, for, depending upon the woods and waters for their supplies of food, they could not long remain in one place and subsist. That they had temporary camping-grounds, at the mouths of nearly all the tributaries of the Penobscot, is evident from the fact, that great numbers of arrow-heads, stone axes, and other Indian implements, have been found there. But there are three localities upon the river, which, it is said, were their particular places of rendezvous – Mattawamkeag, Passadumkeag, and Penobscot Falls – which latter locality was, probably, the beginning or principal point of the ancient Panawanskek. It may be, that that name, in its several forms, was applied to the different camping-grounds, or it might have been applied to the whole territory. At Passadumkeag and Penobscot Falls were French forts, with French and Indian villages. The fort at Passadumkeag was destroyed, by Colonel Thomas Westbrook, in 1722-3, the inhabitants having retired to Mattawamkeag. 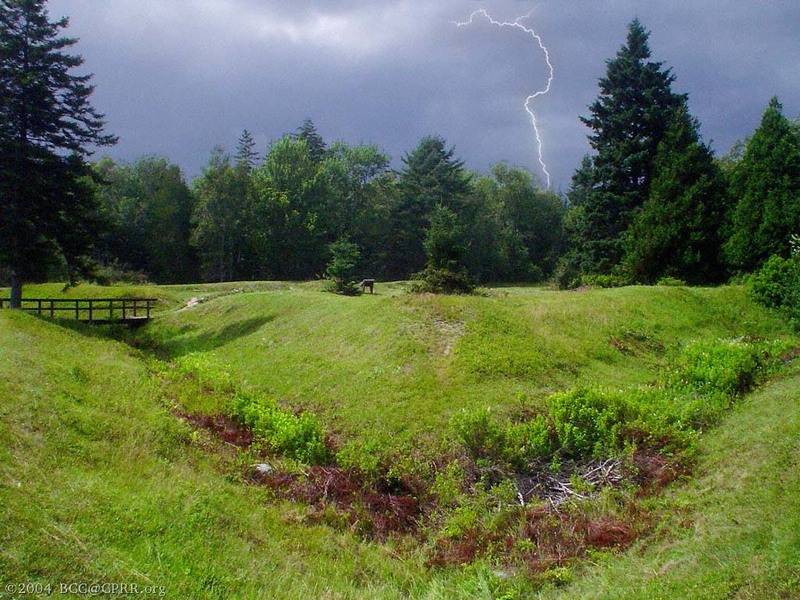 The fort and village at Penobscot Falls were destroyed by Captain Heath, in 1725. A French "Memoir" of 1723, says there were then five villages of the Abenakis. Two were on the River St. Lawrence, near Three Rivers. 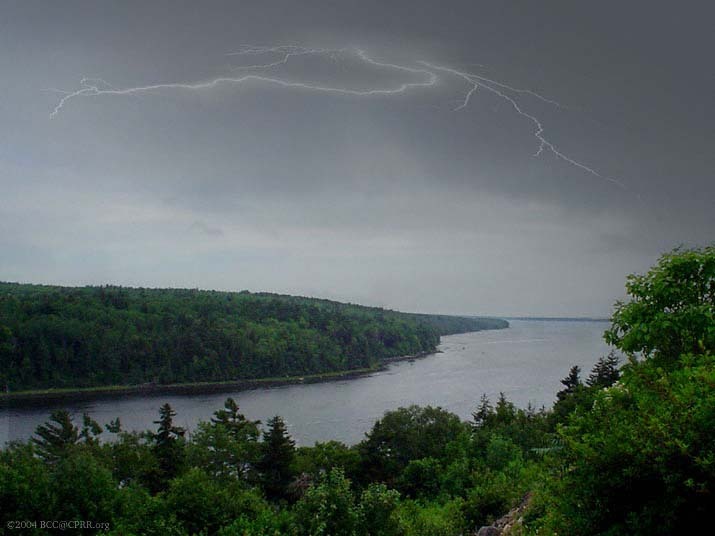 The three others are in the direction of Acadia, and are called, Narantsouak, on the River Kanebekky; Panouamsde, on the River Pentagouët, and Medoctec, on the River St. John. The village of Narantsouak is nearest New England; that of Medoctec nearest Acadia; and that of Panouamk nearly in the centre. Narantsouak was Norridgwock; Medoctec was about East from the town of Hodgden; and Panaouamke was probably at Penobscot Falls, as stated before, and opposite the mouth of the Mantawassuc stream, (near Eddington,) which was celebrated for the immense quantities of fish that were taken there, in early times. Although the forces of Westbrook and Heath were quite large – there being with Westbrook, two hundred and forty men – yet no mention is made by them of a village at Oldtown. Westbrook was five days examining the river and searching for a fort between the place of his landing and Passadumkeag; but lie found none, until lie readied what is now called Nicola's Island, at the latter place; and he mentions no other village. Williamson thinks the village at Penobscot Falls was not built until 1723-4. He says, "it was a resting-place and resort of the Indians, before the village was built." Father Chambault wrote a letter, dated Panawanskek, September 24, 1697, in which he gives an account of an expedition of one hundred and twenty men leaving there, in canoes, on the thirteenth of September, with the design of joining the Indians of "Kinibekki, in order to form, all together, a large party, which might strike a considerable blow at the enemy," and of its going beyond Pemaquid, and being driven back by the enemy, who came in "five English vessels." Major Benjamin Church says, in his report of his expedition, East, in 1696, that he found many rendezvous and fire-places where the Indians had been." The pilot, "Joseph York, informed the Major, that fifty or sixty miles up that river, at the great falls, the enemy had a great rendezvous, and planted a quantity of corn when he was with them, four years ago." It was from this place, probably, that Father Lauverjait wrote a letter, dated Panouamske, 8th July, 1728, in which he says, ''The insolence of the Messrs. de St. Castin [the Baron's sons] has become so excessive, that they have no respect for God or myself. The eldest, who will no many, and is not satisfied with spreading corruption through the village, has now set up a public traffic in aude vie, with his nephew, the son of M. de Bell Isle. They have already drowned one man by it, and think to destroy many others. The youngest of the Castin's never comes into the village but he gets publicly drunk, and sets the village in a flame." [Massachusetts Bay] Governor [Thomas] Pownall, with his expedition up the Penobscot, in 1759, landed on the East side of the river, with one hundred and thirty-six men and proceeded to the head of the first falls, "about four miles and a quarter from the first Ledge" [Champlain's rocks, off the foot of Newbury-street, Bangor] * * * "Clear land on the left for near four miles." "The Plains," in Veazie, opposite the spot where Governor Pownall established his bound, were doubtless the corn lands of the Indians from time immemorial. The soil is a sandy loam; and has always been esteemed for its peculiar adaptability to the culture of Indian corn. The ruins of Fort Pownall (1759-1775), overlooking the mouth of the Penobscot River from Fort Point on Cape Jellison, as they appear today. Lt. Joshua Treat (1726-1802), and his younger half-brother, Maj. Robert Treat (1756-1826), both served here as Armorers and Indian interpreters. A Penobscot Indian, of some intelligence, says, that the aboriginal name of the present Indian village on Oldtown-island, is Panawauske. This Island is within the territory to which that named was applied, centuries ago; but the village is comparatively modern. Captain Francis, an intelligent Chief of the tribe, of some note, in the former part of this century, said that the Penobscots removed from above, on the river and established themselves there, in order to have advantages from the swift water in their encounters with the Mohawks, their chief enemies. Father Vetromile, in his little work, entitled The Abnakis, says, that the meaning of Panawanskek is "it forks upon the white rocks." The Indians say that it means, ''it opens or widens upon the rocks." If there is any part of the river to which this definition applies, it is that part at the "Head of the Tide." Great boulders and ledges, in great numbers, are there exposed, when the tide is out, and the river truly "opens upon the rocks." Between that place and Oldtown, the river is rapid and difficult of navigation; whereas, from there, in the direction of the ocean, the navigation is easy and agreeable, and it really must hare been the point de partance of the natives in their expeditions down the river. The Indians made peculiar claim to the territory extending from that point up the river, and held it, with wonderful tenacity, for years, against the efforts of the white settlers and the Government to obtain it. On the twenty-first of June, 1775, the Provincial Congress of Massachusetts recognized their claim to "territories or possessions, beginning at the Head of the Tide, on the Penobscot river, extending six miles on each side of said river." Bangor was first settled in 1769; and its principal settlement, for several years, was near the head of the tide. A truck-house was built a little below the Penjejawock stream, near Mount Hope; and, in September, 1775, a Conference with Chiefs of the Penobscot and St. John Tribes was held in that house, and a Treaty entered into, which was reduced to writing by Colonel Jonathan Lowden, then late Gunner at Fort Pownall. They resolved to stand together with "our Brethren of Massachusetts and oppose the people of Old England that are endeavoring to take yours and our Lands and Libertys (sic) from us." Not far from the site on Cape Jellison occupied by Fort Pownall from 1759 to 1775, three massive wooden piers were built out from the Cape between 1905 and 1907 to reach the deep navigable waters of Stockton Harbor. 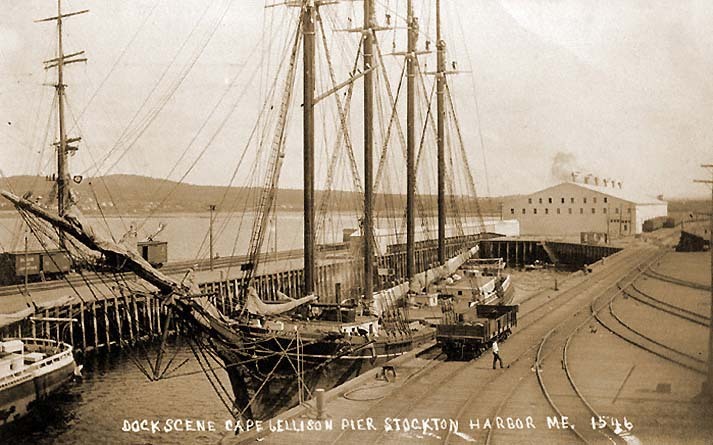 Known as the "Big Docks" and measuring 1,100 feet, 1,600 feet, and 1,750 feet in length, they were serviced by the rails of the Bangor & Aroostook Railroad which thus joined the B&MLRR in nearby Belfast to provide a second rail connection on the Bay to the Penobscot region for the up to twenty or more cargo schooners and steamers arriving by then in the Penobscot Bay each week. Among the major Maine products the BAR brought to the docks for shipment by sea were lumber, paper, and potatoes, and the railroad carried back inland large amounts of coal, fertilizer, bricks, and cement, among other cargoes arriving by water. 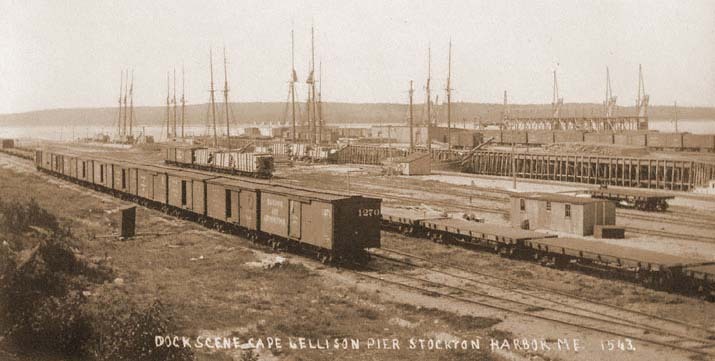 As railroads began to supersede ships for moving these types of freight, however, by the end of World War I much of the docks' business had either disappeared altogether or migrated to the BAR's larger bulk shipping facilities at Mack Point in nearby Searsport, or to three other ports located up the Penobscot River at Bucksport, Winterport, and Bangor. Thus within two decades after they had been built, the docks at Cape Jellison had already fallen into almost complete disuse, and their brief "era" ended altogether when they were destroyed by fire on November 8, 1924. The pilings for the piers are still visible at low tide, however, as are some of their enormous granite runways. After the War, it was found that the Indian claim to this tract was an obstacle to the settlement of the county. The whites encroached upon it, and some ill-feeling was likely to prevail unless the Indian title could be extinguished; therefore, the Massachusetts Government commenced negotiations, in order to obtain a release of it. Massachusetts appointed three Commissioners – General Benjamin Lincoln, General Rufus Putnam, and Doctor Thomas Rice – to obtain a cession of the territory. They arrived at Conduskeag, [Bangor] on the twenty-sixth of August, 1786, and, on the same day, sent Mr. John Marsh, the original settler upon Marsh's-island, to Oldtown, to invite the Indians to a Conference. The answer was favorable; and, on the next day, which was Sunday, twenty-one canoes, with sixty-four natives, arrived at Conduskeag. The Conference was held on the next day. Reverend Daniel Little, of Kennebunk, who was a Missionary in the region, at the time, was present, and gives the following interesting account of the Conference. "AUG. 28, 1786, at 10 o'clock. The Indians were desired to parade themselves in the place and manner they should choose. In about ten minutes, the Commissioners received word that they were ready to wait upon them. Four of their chieftains, Orono, Orsong, Neptune, Neptonbovitt, seated on the ground, close together, in the front, on an elegant green, near the river, the others promiscuously in the rear. The Commissioners, with the two Interpreters, Messrs. [Robert] Treat* and [John] Marsh, walked up to the parade; and the Conference began in the presence of a number of spectators. "Comr. General Lincoln addressed them with the kind intentions of the Government, in their appointment to settle their landed claims to mutual satisfaction; and congratulated them upon the happy close of the War in which they had been our faithful friends and brethren. "INDIANS. We desire to bless God that you are come; and are glad that our hearts are linked with the American. We will now answer you to what you demand. "INDIANS. The Indians signify they are ready to answer. "COMR. REPLY. We are willing you should hold all the Islands in the river, you now improve, from Sunkhole to Passadunk, which is three miles above Oldtown, together with Oldtown Islands and the lands on all the branches of the river above Passcataguess, on the West side, and Montawanskeag, on the East side, of the river, together with White-island and Black-island in the Bay, if you will quit your right to the six miles wide from the river below. "INDIANS. We desire to cross line at Passadunkec for our bounds. "INDIANS. After some deliberation, the Indians signify that the six miles was their land; and if they moved the bound further up, they expected to be paid for it. "COMR. We do give you more land and better for hunting. What further consideration do you desire? "INDIANS. We all want Blankets, Powder, and Shot, and Flints. "COMR. How many blankets will give each of your tribe one? "COMR. You shall have 350 Blankets, 200 lbs Powder, and Shot and Flints in proportion, at the time when you sign the papers, for the ratification of the agreement to which the Indians consented with general satisfaction. Then General Lincoln called upon four persons present as witnesses, which were received and accepted by the Indians, viz., the Rev. Messrs. Little & Noble, Col. Eddy and Mr. Colburn. "The Conference closed at two o'clock with an admonition to the Indians not to spread groundless reports of hostile intentions, but carefully inform the Inhabitants of any thing necessary for their safety. Upon which they shook hands with the Commissioners and parted with general joy. ''The Commissioners sent on shore both Breakfast and Dinner. And the Indians regaled themselves, and then went in different parties up the river. "Through the whole time of the Conference, the Indians never moved from the spot upon which they first seated themselves, and never rose except when they spoke to the Commissioners, till just at the close, when the four public speakers rose together." SIR. I hereby, in the name of the Commonwealth of Massachusetts, desire you to repair, as soon as possible, to Indian Oldtown, or any other suitable place, where you have the highest probability of meeting with the Penobscot Tribe of Indians, and inform the Chiefs, that the Governor & Council have appointed me a Commissioner to bring forward and complete the Treaty the Commissioners made with them at Condeskeag; and that I desire the Indians, especially their Chiefs, to meet me at Condeskeag, on next Tuesday forenoon, and to receive the blankets which we have now brought up from Majorbagaduce, by order of the Governor and Council, to be delivered to them when they shall sign the papers for the confirmation of the agreement. Of your doings you will make return to me at Conduskeag. You are also directed to take some other suitable person whom you shall choose, to assist you and to accompany the Indians to Conduskeag. SIR: I met Mr. Colburn, proceeded according to the within to Indian Oldtown, called Penobscot, and found all the Chiefs of the Tribe there, with a considerable part of the Tribe, to whom, agreeable to my trust, I delivered your message, and the Chiefs told me they would have me withdraw from them and they would give me their answer. Mr. Colburn and myself left their Council; and in about an hour they sent for us to return, and they told us they would not send their answer in writing but they must depend on me to return their answer. They said they had considered on the matter; and that they had been down a number of times, on public business; and that their young men were apt to drink, and that their number was large, and that it was most proper to meet at their town, and that they should be glad to meet Mr. Little and any other gentlemen, as every thing might be done calmly and coolly with us. Mr. Little was in doubt whether he might not compromise the dignity of the Government by yielding to their proposition. He, therefore, conferred with ''some of the principal gentlemen on the river," who thought, with him, that our condescension with respect to the circumstances of place might be consistent with the honor of Government, especially as it was a condition not to be dispensed with without the loss of the only probability of a Conference. In other words, to make a virtue of necessity. Accordingly, he notified them that he would meet them, at their town, on the next Saturday. He felt it important to the success of the mission that the "gentlemen of character" of the region should accompany him; he therefore made up a party, consisting of Major Treat, Reverend Seth Noble, Colonel Lowder, Colonel Brewer, Mr. John Lee, and Mr. William Colburn. The party left Major Treat's, near the mouth of the Penjejawock stream, on the nineteenth of June, at about two o'clock; reached Mr. Colburn's, at Deadwater, [now Stillwater] and staid over night. Mr. Little gives the following account of the succeeding transactions. "SAT., JUNE 21. Set off about sunrise, passed a Western branch of the river to an island seven miles long, [Marsh Island] walked upon said Island through a trackless wood about six miles, when Indian Oldtown, about two hundred acres, opened to view, with a thicket of houses on the lower point of said Island, just above the great Falls. Immediately upon our arrival, in open view of the town, a number of their canoes were manned with sprightly young men, in which they came over (about forty rods) to transport us into town. As we landed, their shore was lined with women and children. We walked up to their parade, about fifteen rods from the shore, (a walk very smooth, about three rods in width, lined, on each side, with a range of houses built with poles about six inches diameter, and the same asunder, placed perpendicularly and covered very neatly with bark, in shingle form,) was introduced into their capital house by a waiter, who stood at the door; only one Sachem in the house of conference, who made us very welcome, directing us to take possession of one half the room, 20 x 40, which was carpeted with fur. "Very soon, came in all the Sachems and placed themselves on the opposite side, which being divided by two poles from one end of the house to the other. Then about forty of their men of years place themselves in rank next the Sachems; and lastly an old man, about a hundred years, a former Sachem, was introduced in memory of past services. They then fired a cannon abroad. "The Sachems declare they are ready, I addressed them in written words, declaring the design of my visit to them, by the appointment of Government, which was to bring forward and complete the Treaty made at Conduskeag by General Lincoln, &c., 26 Aug. 1786; informing them that I had brought up the articles to be given to them, Blankets, &c., which they should receive at Conduskeag from aboard Capt. Holbrook's [vessel] as soon as they would sign the paper which contains the land we buy of them. I then stated the agreement; explained the purport of each paper of conveyance; and observed that Government had done every thing, on their part of the agreement, and expected that they would make their mark against the seals – holding them open to view – upon their doing this I should give them the parchment in my hand containing the gift of land to them, together with 300 blankets. "We are thankful to see Mr. Little here, and desire to be remembered by the Governor and Council, and are glad to see all well here together. The King of France says, we are all one – it is all peace; and the King of England says it is peace, though it was War sometime ago. "BROTHERS, we are all one; we don't talk of hunting one another. We live here to serve God; we all live together. We and our children mean to help each other. We don't mean to take any lands from you. If any body takes any land from us it must be King George, for General Court and General Washington promised we should enjoy this country. General Washington and General Court told us, if any body was going to take our lands from us, they would let us know it. They told us, if they knew any thing was doing against us, they would tell us. "BROTHER, now we are here together – when we were at Conduskeag, we had not a right understanding of matters; and the young men were not all collected, and we were pressed to make that Treaty contrary to our inclinations. "BROTHER, God put us here. It was not King of France or King George. We mean to stay on this Island. The great God put us here; and we have been on this Island 500 years. And we have been of the French King's religion, and mean to be so always. From this land we make our living. This is the general speech of all our young men. We don't know any tiling about writing. All that we know, we mean to have a right heart, and a right tongue. "Is not Mr. Little a Minister?" "BROTHER, Ministers ought not to have any thing to do with public business." "For those two strips of land, by the river, Massachusetts Government, according to the agreement made by General Lincoln, now gives you, up in the county, four times as much land for hunting, two Islands in the Bay, with all the town and Islands in the river you now occupy, with three hundred and fifty blankets, &c. You shall be assured of the enjoyment of the religion of the King of France, without interruption, as long as you please. I am not here to-day as a Minister, but a Commissioner. I saw the Governor and Council, less than twenty days ago; what they then spake, I have now a right to speak. You are sensible Government has fulfilled all, on their part, of the Treaty made at Conduskeag. You say your young men were not present then. Your fathers used to ask for the children. The same Fathers and Sachems that were there are now here. Will you make your mark for your names against the seals on this paper, which tells what land you give to Government, and accept of this parchment, which is the act of the General Court, giving land to you, and then receive the blankets, &c? Will you do this or not?" ANSWER. "We don't know any thing about writing. We have put our hands to many papers, at Albany, New York, and elsewhere: but we will not put our hands to this paper, now, nor any more papers now; nor any other time forever hereafter." Mr. Little made some remarks upon another subject, and, at their conclusion, the Conference closed. "We then," Mr. Little continues, "wished them all well and took our leave of them at the house of conference; but their Chiefs asked leave of us to wait upon us to the water side, when I repeated a former declaration to impress their minds with a sense of the authority of Government, viz: that, although they refused to put their hand to any paper for the confirmation of the Treaty made at Conduskeag, yet they might expect that Government would abide by that agreement, made by words and witnesses, and expect the same from them, to which they made no reply. They provided young men and canoes to carry us off the Island; and, as we left their shore, they fired their cannon and gave us other marks of friendship with us. "The Conference about four hours. Not a drop of rum by us or them while in the town. The Conference began between eight and nine o'clock. About fifty, mostly their heads of families, who occupied one side of the house. Not a word spoke or a smile expressed by any of them, except their Moderator or orator, and a few directing words by the Council to assist their speaker. In the midst of the Conference, about twelve o'clock, the bell rung and they made a composed mental prayer, for about ten minutes. When they appealed to Heaven as given them a right to the soil, all the Sachems rose up from the ground on which they sat and stood in a posture, for a minute, expressive of an appeal to the Great God, of the truth of their declarations. Four men were distin-guished as their acting Chiefs, viz: Orono, Orsong, Esq., Neptunebovitt, Orsong Neptune. No women or children seen or heard through the Conference. They declined giving us liberty to see the Tribe paraded and numbered; but those who were most acquainted with the Tribe judged, as they appeared on the shore, at our landing, to be present about two hundred." Mr. Little and his party returned, the same day. Orono, the chief Sachem, with his wife, followed them to Conduskeag, and to Colonel Brewer's, at Segeundedunk, now Brewer village; but he gave no encouragement that the tribe would ratify the Treaty. Mr. Little told him that he should be on the river about a week or ten days; and that any of the Sachems might renew the Conference with him, if thought fit, at Orrington or Majorbagaduce. Mr. Little lingered upon the river, with the hope that the Tribe would change their mind; but he was disappointed, and was obliged to report to the Government his want of success. The mouth of the Penobscot River as viewed from the East shore near Prospect, ME. The Penobscot Bay, Stockton Springs, and Fort Point are downriver to the right. The West shore of the river as far as Bucksport is constituted by Verona Island. The Indians, however, afterwards claimed title to the territory six miles wide, on both sides of the river, above the thirty miles relinquished in 1796, to an indefinite extent, and assumed to sell the timber from it. To prevent this, the Government of Massachusetts appointed another Commission, in 1818, consisting of Edward H. Robbins, Daniel Davis, and Mark L. Hill, who met Governor Ettienne, Lieutenant-governor Neptune, Captain Francis, and other Chiefs of the Tribe – in all twenty-seven – on the twenty-fourth of June, at Bangor. A Masonic celebration occurred at this time; and it was deemed expedient, by the Municipal Officers, to make the occasion memorable by a general celebration. Accordingly, they provided for a holiday and a procession, the Freemasons gave the Commissioners a dinner, at Lumbert's then famous hotel, on Hancock-street; after which the procession, consisting of the Municipal Officers, Magistrates of the County, Military Officers, Rev. Thomas Williams, Strangers, and. Citizens, escorted them to the Court-house, [''Ancient City Hall"] where a large audience of ladies and gentlemen was assembled. The Chiefs, who were rather noble looking sons of the forest and showily dressed, accompanied by General John Blake [Indian Agent], Major Treat, and Captain Webster, afterwards entered the house. As they entered, the Commissioners arose to receive them. Solicitor-genernal Davis – who, tradition says, had a kindly regard for the fairer portion of the Tribe – addressed them. Lieutenant-governor Neptune, a Chief of commanding figure, of great dignity of manner, and extensive influence among his people, made the reply. The result of the conference was, that Massachusetts obtained a release of all the Indians' interest in the territory, excepting four townships, six miles square, two contiguous to the nine townships formerly released, and two near the mouth of the Mattawamkeag-river – one on each side of the Penobscot and opposite each other – which, with the Islands in the river, above Oldtown Falls, were to belong to the Indians, for occupation, forever. As compensation for this relinquishment, the Commissioners agreed that the Indians should have, also, for occupation, two acres of land in Brewer, opposite Kenduskeag-point; to employ a suitable man to teach them husbandry; to repair their church, at Oldtown; to deliver there, in October, yearly, five hundred bushels of corn, fifteen barrels of flour, seven barrels of clear pork, one hogshead of molasses, one hundred yards of broadcloth, of blue and red, fifty blankets, one hundred pounds of gunpowder, four hundred pounds of shot, one hundred and fifty pounds of tobacco, six boxes of chocolate, and fifty dollars in silver. At the time, they made them a present of one six-pound gun, one swivel, one box of pipes, fifty knives, six bass kettles, two hundred yards of calico, two drums, four fifes, and three hundred yards of ribbon. An annual stipend of three hundred and fifty dollars was appropriated by the Government for their religious teacher. After the separation of Maine from Massachusetts (1820), Maine assumed the obligations of Massachusetts to the Indians, and renewed the Treaty, at the Court-house, in Bangor, on the seventeenth of August, 1820. The Commissioner, on the part of Maine, was Hon. Lathrop Lewis. The first meeting was on the fifteenth of August, when the Commissioner made the proposition that Maine would take upon itself the obligations of Massachusetts, provided the Tribe would release Massachusetts. The Chiefs – who were the same who made the last Treaty with Massachusetts – took time to consider. On the seventeenth, the Conference was renewed. The Chiefs were dressed in scarlet coats or robes, ornamented with silver brooches and with beads, after the Indian mode of that day, and made quite a distinguished appearance. Captain Francis made a speech; and, in behalf of the Tribe, accepted the proposition of Commissioner Lewis, to which Colonel Lewis replied. After the Treaty was signed, Colonel Lewis presented, from Governor King to Governor Ettienne and Lieutenant-governor Neptune, a fine piece of scarlet broadcloth, for each a coat. To each of the other Chiefs, he gave a silver breastplate, upon which was engraved the Arms of the State of Maine. The presents were received with great apparent pleasure. From the facts above-stated, and from the great attachment of the Tribe to the strip of territory extending from the Head of the Tide, up the river, we may conclude that that was the ancient and original Penobscot or Panawanskek; and that the chief resort of the tribe, anciently, was at the Head of the Tide. The French, doubtless, set the Indians the example of having permanent villages. They established Missions; built churches, and forts, and houses; and the Indians clustered about them. The village on Oldtown Island probably originated in that way. It might have been occupied by the Indians, as a camping-ground, five hundred years, as Orsong Neptune said; but the Indian who stated that the village was Panawanskek, and, at the same time, stated that it was a hundred years old, was probably nearly correct. Transcribed and annotated by, and courtesy of the Bruce C. Cooper* Collection. *Bruce C. Cooper is a great, great, great, great grandson of Lt. Joshua Treat, a great, great, great, great grandnephew of Maj. Robert Treat, and a great, great, great, great, great grandson of Col. Jonathan Buck. 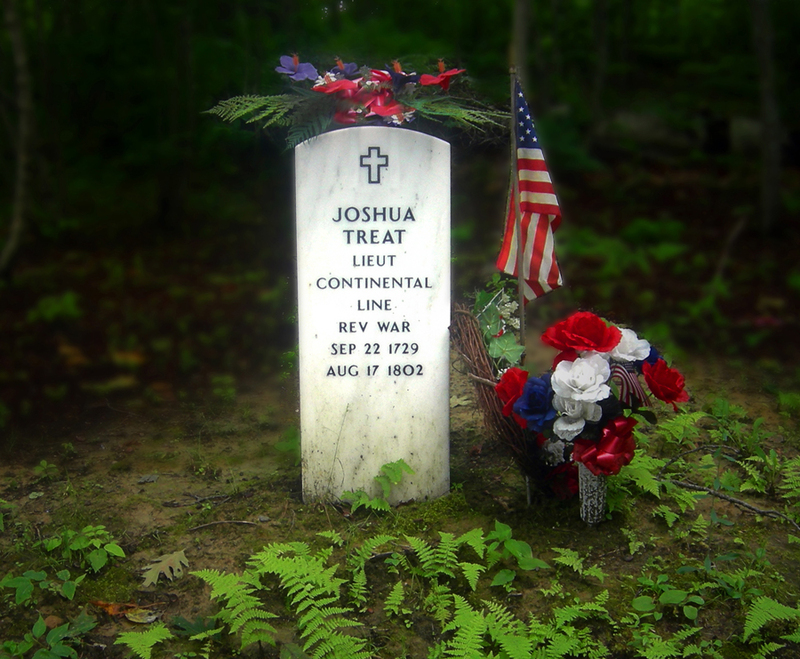 The grave of Lt. Joshua Treat (1729-1802), Stockton Springs, ME. Also see: "Joshua Treat: The Pioneer Settler on Penobscot River." by Joseph Whitcomb Porter, 1889.